The start of any journey can be exciting but needs proper planning. I think that any new start up or venture by an NGO or designer needs careful consideration. Tiny Houses would like to build a physical community. There are lots of issues that they need to address. The first reason for creating a work team is structure. Creating a core work team that you can trust will set a good foundation for a successful journey. 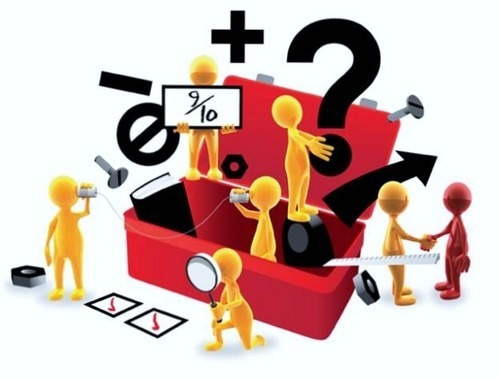 Finding link minded people with different skill sets will be useful in building up your tool kit. A group leader is needed, often the founder. Someone who is passionate about the project and makes the time to put it at the forefront of things. 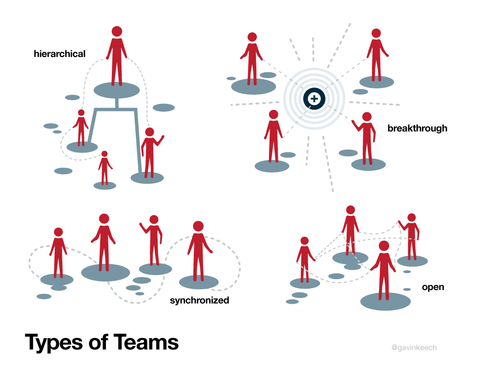 Creating a team will give direction and a shared workload. The size of the group needs to be considered. As I’ve mentioned before, group size determines limits for intimacy. Too big and the team may lose efficiency. Get it right, and you may see results quicker than you thought you would. The second reason is utilizing tools. Work can be shared and completed far more effectively with a varied group of skilled people. Achieving the right blend of people will boost your chances of success. One important tool that is needed is a technology steward. For Tiny houses who struggle with awareness, possible misconceptions and funding, a technology steward is key. Somebody who understands Tiny Houses can pair the right online platforms to address their goals and issues and build their online community. This is someone who definitely needs to be in the toolbox. The third reason is professionalism. We can be our own worst enemy at times. We can have a brilliant new idea we want to try, but can often fail to be strict with ourselves and may take our foot off the gas. A group brings with it a positive pressure. You try harder because you have teammates you don’t want to let down. Regular meetings are arranged and progress is measured. A satisfaction comes with it, knowing that you are collectively working towards your goal in a structured manner. Writing up a game plan, as we have done for Tiny Houses will give structure, goals and direction. Finding the right tools for the job can help create a bright future for Tiny Houses. OK, it’s already week 7. Setting aside panic about final result and thinking of what is on my mental shelves that wasn’t there 2 months ago. In Shahab’s Prezi about multimedia presentation, he had a storyboard example about peanut butter and jelly sandwiches. I loved the detailed ideas, including that you should probably explain the difference between jelly, jam and preserves. Maybe it all was there, only it was pushed to the back, covered in dust and the label faded a little bit too, to the point where you are not sure what’s in that suspiciously looking jar. Yesterday I couldn’t remember what the 4P’s were, and I have a degree in Advertising! Gosh, that was embarrassing. So I learned that if I care about something, if I think I will use it in the future, then I should keep it in the forefront and use that knowledge before the shelf life expires. RSS is a great way to do that. I will make it a habit to subscribe for interesting websites (such as Beth Kanter’s one) on social media marketing and read it during breakfast, instead of re-watching my favourite show. One thing had been certainly mislabeled in my head: teamwork. I was chatting with a former classmate the other day, and I mentioned this project. She immediately replied: “I always hated teamwork”. I guess she and I had the same experiences. In Hungary, this would look like: in a group of 5, one usually has a full time job and can’t be bothered to attend meetings or do anything for the project, two have terrible ideas but are so bossy you stop contradicting them after a while, and two care about the project in the beginning, but that enthusiasm seeps away in the dysfunctional team. The end result is something the latter two forged in a last attempt to make their grade a pass. I learned that it doesn’t have to be like that. Even though with a team of 7, planning a meeting is a nightmare in its own right, the work we’ve done together was certainly not. It helps a lot if everyone on the team has the same goals and if everyone understands that it is a team. This setup even reduced my tendency to take over every task, just because I think I am the only one who will not make a complete mess of it. It is trickier indeed than just managing my own schedule and completing a project on my own, but the result is more delicious too, because it is made of different fruits. I learned about networks and online communities, and how amazingly available people are to help you if you only reach out. The trick here is that you have to have something to say, as clearly and translucently as jelly! It doesn’t hurt if the content is juicy, ie. if there is potential in it to go viral. 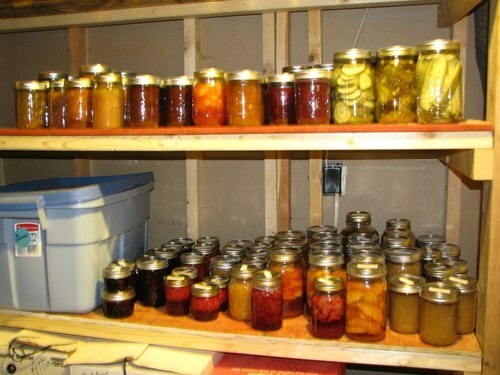 In this case, the pectin, erm, community support will occur naturally. So, these are the occupants of my shelves right now, and I must add that the shelf itself also became more solid thanks to the structure of the course. Every topic is a new shelf, and some things (like crowdfunding) definitely didn’t have their own dwelling place in my mind before. The next step? I would like to learn more about viral campaigns. I have seen some rise and fall, and some just fall plainly on their faces before they even caught on. It sometimes seems like you cannot plan a “virus”, but I suspect it is possible. I am going to research this topic further. Also, video making comes across in all of our classes, so the next weeks are largely going to be about that. I already have some experience in photography, video editing and presentation techniques, but I’m sure my teammates will surprise me with what they have. Im happy to say that we have made quite some progress and ourgoal is becoming clearer and clearer. We came up with some rought spot on ideas and presented them too our NGO in our second meeting an he was actually quite interested and is curious of what more we present him. The topic of the last class was all based upon teamwork and we watched a video in class which was quite interesting. After hearing that the size of groups really matter I actually had this quick thought in my mind that ‘Yes that is right’ that odd numbered groups are creative while even numbered groups ahev more stability. That was also something I was discussing before class with this person from group 12. And he said that it is really hard to work with so many people because sometimes there are less tasks and ore people and it becomes more chaotic. To make it work you have to find a way to work together, acknowledging one another and listen to each other’s ideas. 2. We have different cultural backgrounds so this always allows each one of us to present ideas in different ways and maybe related to our experiences in the past. *We had some problems such as we were too focused on our final video while we didn’t have proper ideas/suggestions for our NGO which is when we realized as a group that we have to work on that and we are on track. Since I was small I preferred working alone than with a group of people.I always felt that in a group if I present any idea nobody will acknowledge it or take it into account. I wasn’t confident enough. So since the beginning of Project Communities it has been a really big challenge for me and I have been pushing myself forward, and I feel that I have improved a lot as I do present any idea I have, even if it is wrong. And I give my opinion on things a lot. I feel more confident now working in a group. I think that groups are very useful as one idea to oneself might not even be right when there are more people there to give opiniions about it and that makes the idea better. Groups are similar to sport teams such as football where everyone has his/her own role for instance the defender, keeper etc. And by passing the ball to one another and avoiding the opposing team you goal, there are times when your team is going to lose but when you work together your flaws, you will succed and reach your GOAL! Doing research on companies who would be willing to collaborate or sponsor. And researching on other NGOs what they do that could be useful to our NGO. Doing a survey by making a questionnaire and making students from university and schools do it to get more ideas. My task is to do the survey and because I have never done this before it is going to be a new expere and I am looking forward to it. TOGETHER WE ARE ONE! GO GROUP 11!! 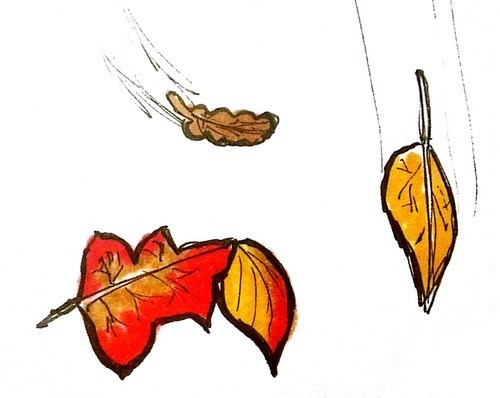 Posted on October 4, 2014 by Karolina's Little Thoughts about Big Projects. This post was originally published at the Project Community blog: Karolina's Little Thoughts about Big Projects. The last class was dedicated to team work. Although, I studied before, I have never experienced so much of teamwork as here in the Netherlands. I always worked only with my friends and it was never a long-term project. Here it is a bit different. I had to start to work on a project with people whom I didn’t know so much at the beginning. First we needed to get to know both our strengths and weak points, and then split the tasks between us. I know, sometimes I can be a bit chaotic as I think loudly too often. To organize my thoughts I always need a paper. That is why when I am lost in the group discussion, I often start to write down some things and the order them into plan. Only then I can see things clearly. As I am quite busy most of the time, I do it also for myself, not only for studying. I am also a kinesthetic person. I learn, when I move. That is why I gesticulate too much sometimes. I am also get excited way too easily and that is why I always want to go straight to the point. That is why I need my colleagues to stop me and my stream-of-consciousness working style. We are 5 in our group, yay! :D As it was explained in the video our group size is just perfect. If two are voting for, and two against, then there is a third one to say what is better. Our nationalities are: Estonian, 2 Germans, Pakistani and Polish. I think that knowing what is the working style in each of these countries we can be more patient in our work. We are after week 5 right now. Last Tuesday we had the second meeting with the chairman of our NGO, Children of Mexico. The meeting with the chairman was a good experience for me We asked some questions considering target groups and communication within the organization. Henning was honest about how his company works and shared with us a lot of stories about it. Henning explained the structure of the company as well as he told us about the Mexico and the Mexicans. The answers, which we received, helped us to give insight in the work of NGOs and helped us to create the strategy for next weeks. Based on the meeting we listed down the tasks to do. We have decided to focus on two important matters: how to get volunteers and how to get money and donators. We shall also continue with creating a video. To do so, we have divided different tasks between us. I am responsible for both video and the research about the companies and their interest in CoM. Middle. Middle of the module, middle of the process, middle of our team relationship. The start was ok, full of emotions and confusions but than things changed week by week, day by day. We created a pace. What really means creating a pace? We defined a group personality (based on the decisions we made ). This is what I thought this week about. When I noticed how the ideas blend with our involvement, I realized that a group is like a human being. You can’t be you without an eye or an arm, or even more you can’t survive without your heart. Without your emotions,feeling,wishes you are almost death. All my life I was an individualist, I was raised in this kind of environment. For example, this is why the first week was on the sign of confusion. Us, as a team were kind of distracted, cold with each other, we were feeling uncomfortable. 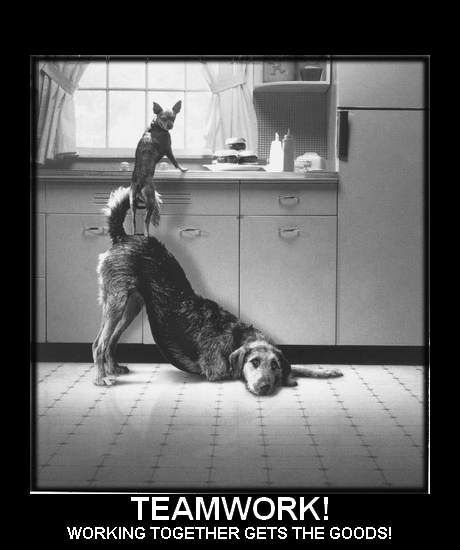 Strange that when you create a team the first step is to delegate the tasks. In my opinion, after spending time with my team, the most important thing is having clear and logical objectives. We were full of questions about what PAGE is, what do we need in the end, why we do this? We figured it out about our goal and skipped to the next step. Delegating tasks. It was great that we highlight our skills, so we can support the group. It is very hard to think about what are you good at when you are in a team, with people you don’t know. You don’t know how good they are at the same skills as you. Then we explode as a team. Everyone had an idea, we came with outside sources, we wanted to move the mountains in one week, which was great because we were full of enthusiasm and initiative. What we forgot? We forgot to organize. The good part though was that we realized this and took action. We wrote everything on paper and thanks to Emilie we have a very, very organized plan, that will help us in the future. We were really surprised when we saw that she sacrificed her time for the sake of the group, so we’ll return this back. Which one appeals to your group most? Mine is kind of an open type, but there are situations when we really synchronize. We still have time to make the atmosphere more informal,because we lack on this, but this is the start. Actually, I am impressed with my personal development in such a short time. From a totally individualist person, I found it good now to work in a team. This was my experience so far in this team. You can learn too from my story. I can’t wait to learn from yours! P.S I highlighted for you some things that I feel are compatible with a teamwork. 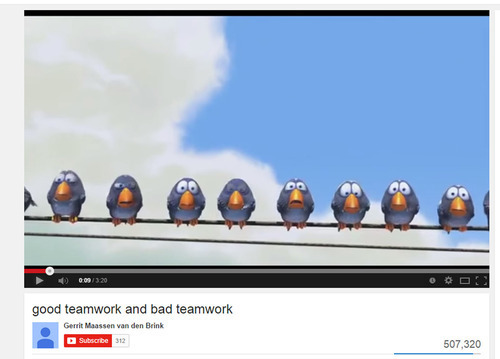 Click on the picture (at least it works on my blog), if you want to see the cutest animation ever about teamwork!!! I have found myself in quite a fascinating work group of 7 members from different corners of the globe. We are from Brazil, Benin, Iran, Italy, Germany, and Britain. Working with such a diverse group isn’t a regular occurrence for me, so how should I approach this and how should we approach this? Well firstly we recognize that this is a great opportunity to learn from each other. We have more pools of knowledge to pull ideas from. Coming from different cultural backgrounds means that we have been shaped by different values and so we’ll probably approach challenges in different ways. This has the potential to provide both advantages and disadvantages. However, overcoming any difficulties will be helped by the team structure. We’ve been discussing how group numbers can affect the functionality of a team. Even numbers can bring stability to a team, members can work in pairs. While an odd numbered team encourages creativity. This may be because there is less rigid structure so members are working from multiple angles. We’ve found that having 7 members is on the large size. Group size determines limits for intimacy. This has been making it difficult for all of us to attend the same meetings and to listen to every members thoughts. To solve this, we’re considering splitting the team in to pairs with one team leader. Splitting a team in to smaller groups will create a good team dynamic. This will maximize potential using different individuals strengths and pooling all our work together at a later stage. This is a useful thought for our NGO, Tiny Houses. Forming smaller groups according to talent will make their community stronger. For instance small groups of technology stewards and people with marketing experience can work separately and efficiently, then at the end work together to find the best way to increase their ‘brand’ awareness in Florida. The video calls with our NGO are proving highly effective. With 7 members present, there is always a question being asked or a thought shared. In a short period of time we can discuss a lot of information. So we’ll definitely carry on this trend. So far, our first task as a group is proving very useful in exploring team dynamics and team efficiency. This knowledge will be vital as we progress and take on more challenges in the future. My first project as the next world class innovator called ‘Project Communities 2014’. In this project we have to help our clients (NGO) to overcome their challenges and obstacles online communities and networks. My first personal goal for this project is to gain as much experience as i can from the cooperation between me, our team, and the company. And the second one is I’m hoping to established a bigger online communities so i have more source of inspiration for my design and my innovation. As a group of course i hope we can have a good and efficient team work, helping each other and show some enthusiasm for the project (no dickheads are allowed). In the end I hope that our team can give not only a good video but also a useful one for our client. Finally to help me and my team achieve our goals I’ll give everything I’ve got in me, especially when it comes to giving presentation or doing research (those two are my greatest strength).